Lucky Star's story portrays the lives of several school girls attending a Japanese high school with a very loose humor tone. The setting is based on the town Kasukabe in Saitama Prefecture. The main heroine is Konata Izumi, an athletic and intelligent girl who, despite these attributes, is not in a sports club, and has low grades. Her laziness at school is due to her love for anime and video games and lack of interest in anything else. 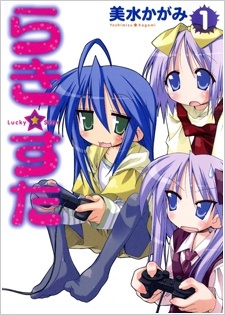 The serialization began with the four main characters in their first year of high school: Konata Izumi, Kagami Hiiragi, Tsukasa Hiiragi, and Miyuki Takara. As the story progresses, they move onto their second and third year.